In addition, firms that were early adopters of technology were significantly more likely to report higher profitability in the last year than were firms that lagged in technology adoption. These are among the results of the 2019 Future Ready Lawyer Survey, conducted by Wolters Kluwer Legal & Regulatory and being released today as a 24-page report. “The legal technology boom has been underway for a few years – but for the first time, we are seeing a clear competitive advantage for firms that are adopting innovative solutions earlier than others,” said Dean Sonderegger, vice president and general manager for legal markets and innovation at Wolters Kluwer. Leading, meaning the organization is effectively leveraging technology already and will continue to do so. Transitioning, meaning the organization is somewhat leveraging technology and plans to invest more over the next three years. Trailing, meaning the organization is not leveraging technology now and has no plans to. The good news is that the survey found only 4% of organizations to be trailing, and so the report focuses on the 49% it classified as leading and the 47% it identified as transitioning. Following are some key findings of the survey. 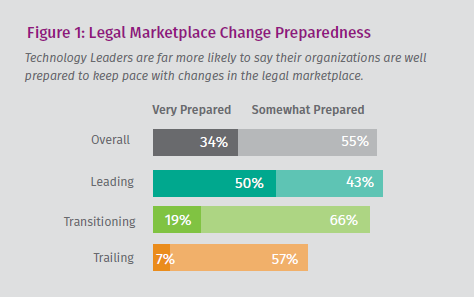 Overall, roughly a third of lawyers (34%) believe their organization is very prepared to keep pace with changes in the legal market. But among technology-leading organizations, 50% believe they are very prepared. Among transitioning organizations, 19% feel very prepared. Asked about the top trends impacting them, more than 7 in 10 lawyers answered “coping with increased volume and complexity of information” (72%) and “emphasis on improved productivity and efficiency” (71%). Yet lawyers overall are ill-prepared to respond to the trends that impact them, the survey found. While lawyers identified these as the top trends impacting them, only 31% said they were very prepared to address these issues. Understanding legal technology of highest value. Meeting changing client and leadership expectations. Financial issues, including greater price competition, new and alternative fee structures, and cost containment pressures. More than half of lawyers across the U.S. and Europe say their organization’s technology investment will increase over the next three years. Not surprisingly, technology-leading organizations are more likely to expect increased future investments in technology. Notably, technology leaders do not only invest more aggressively in technology, they also realize greater profitability. 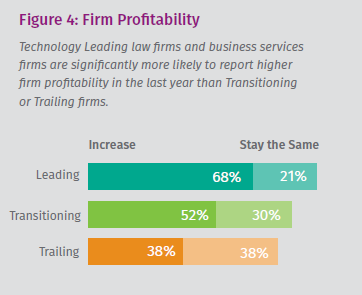 The survey found that 68% of technology-leading law and business services firms increased profitability from 2017 to 2018, while only 52% of transitioning firms did so. The level of profitability also differed, with leaders more likely to have had double-digit growth rates. Why do lawyers resist new technology? The survey explored the reasons and found that top among them, cited by 36% of respondents, was lack of technology knowledge and understanding of skills. Other top reasons were organizational — such as lack of a technology strategy, culture that fears change, or leadership resistance — and financial, mainly based on price or inability to show ROI. 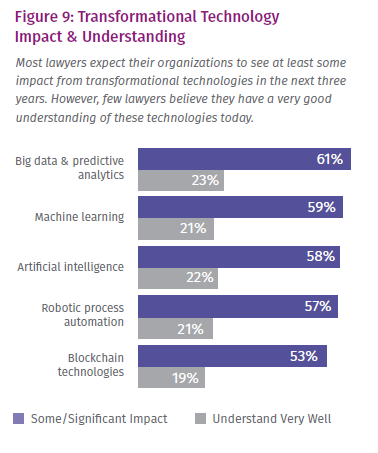 The survey asked several questions about the technologies lawyers use, classifying them as “foundational” for core technologies common to law practice, “enabling” for technologies that improve productivity and efficiency, and “transformational” for technologies that deliver demonstrable new business results, such as artificial intelligence, machine learning, predictive analytics and blockchain. With regard to these transformational technologies, more than half of lawyers say they expect to see some impact from them over the next three years. 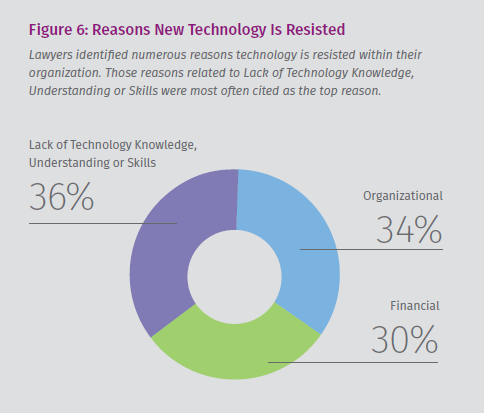 However, fewer than 24% of lawyers say they understand these technologies. As might be expected, the survey found generational differences here, with millennials more likely to say they have a very good understanding of these technologies than their Gen X or Baby Boomer counterparts. AI is already in use at 33% of leading firms, with another 36% planning to use AI within the next three years. No firms said they currently use blockchain, but 70% of leading firms and 48% of transitioning firms expected they would within three years. Among leading firms, 79% will be using both predictive analytics and smart contracts within three years. Price (57% view it as among the top three concerns). Ability to understand client needs and partner with clients (48% view it as among the top three concerns). Specialization (46% view it as among the top three concerns). For corporate legal departments, the top challenges they face will be reducing and controlling outside legal costs, improving case and contract management, and automating routine tasks and leveraging technology in work processes, the survey found. Greater collaboration and transparency between firms and clients. The survey report concludes with a section of “insights from legal industry luminaries.” I was honored to be among those asked to contribute to this section, where you will also find the thoughts of Markus Hartung, director of the Bucerius Center of the Legal Profession at Bucerius Law School, Hamburg; Jean P. O’Grady, publisher of Dewey B Strategic and senior director of research and knowledge at DLA Piper; Dean Sonderegger, vice president and general manager, legal markets and innovation, Wolters Kluwer Legal & Regulatory US; and Jeroen Zweers, innovation director, Kennedy Van der Laan, Amsterdam. The survey included quantitative interviews with 700 lawyers in law firms, legal departments and business services firms of all sizes across the U.S. and 10 European countries: the United Kingdom, Germany, Netherlands, Italy, France, Spain, Poland, Belgium, Hungary and the Czech Republic. 339 lawyers from law firms. 272 lawyers from corporate legal departments. 89 lawyers from business services firms. The survey was conducted online for Wolters Kluwer by an international research organization from Dec. 10, 2018, to Jan. 13, 2019. The full survey, with many more details, can be downloaded free from Wolters Kluwer.